Full-length wedding silhouettes of the bride and groom, cut freehand by Charles during the reception then left on display for the reminder of the day. 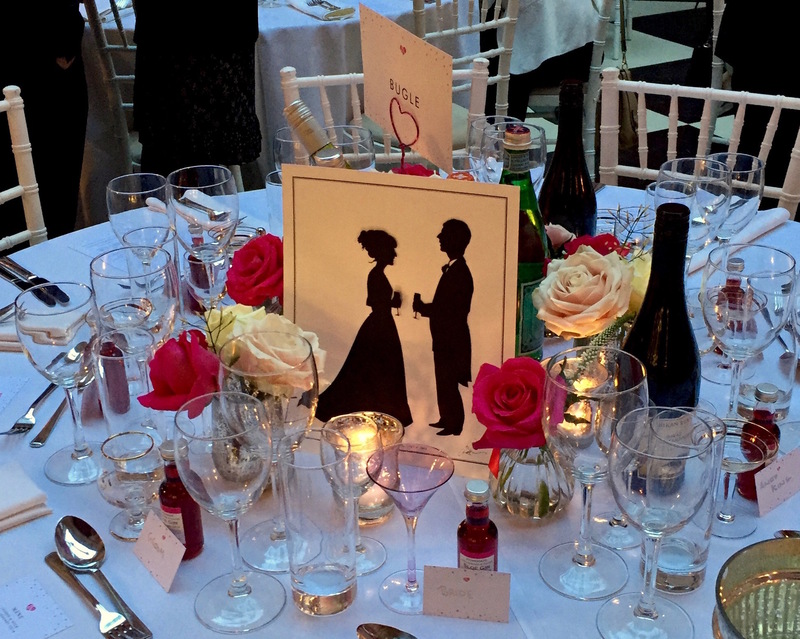 The artist will usually begin cutting silhouettes during the reception, and then continue around the tables during the wedding breakfast. The cuttings will provide a buzz of interest and an opportunity for members of both families (who may not have met before) to get to know each other. The best time to get your own wedding silhouettes cut is usually as the guests are taking their seats, just before you make your entrance. Charles will cut a pair of full-length silhouettes, there and then, so they can be displayed during the meal. These will make a great talking point for the remainder of the day. 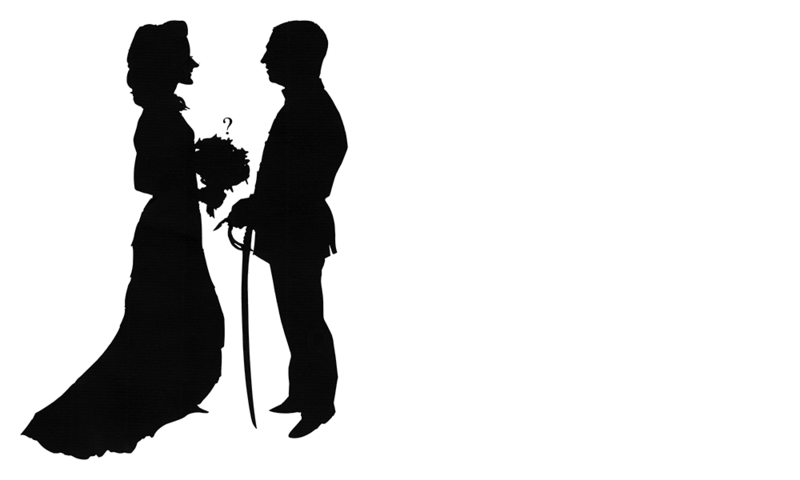 Some people prefer to book a silhouettist for the evening party, as they may have extra guests arriving after the meal. There are a range of extras which works particularly well at weddings. Details are on the Branding page. An artist’s print, made by scanning the white off cuts kept by Charles at a wedding. Many of the guests have been cut as face-to-face couples. 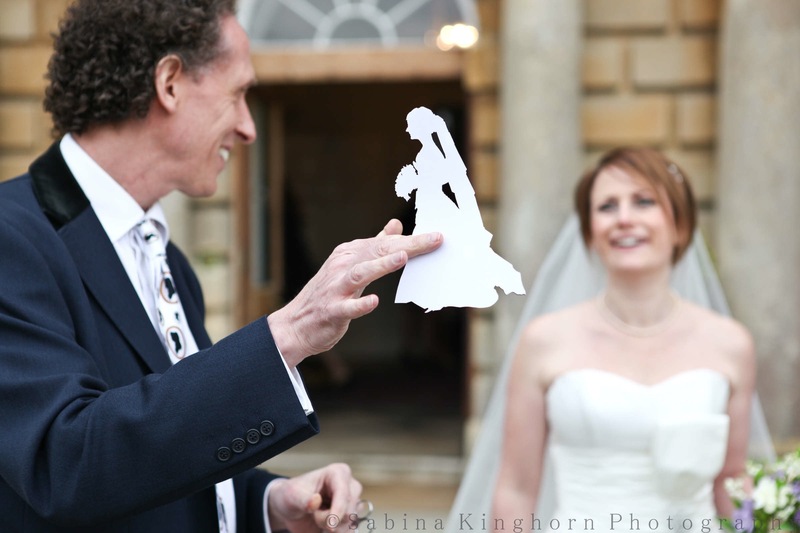 The most popular extra we offer for weddings is the A3 giclée print of all the wedding silhouettes cut on the day. A natural by-product of cutting a silhouette is a white off-cut, or negative copy. Traditionally these are kept by silhouettists in much the same way that a photographer keeps his negatives. 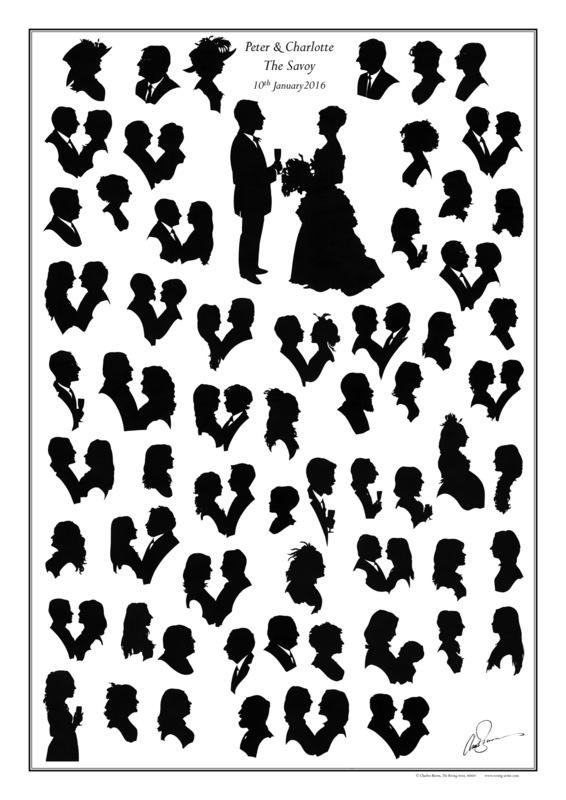 They can be scanned and arranged to create a record of all silhouettes, complete with a caption. You will have a lot of fun picking out familiar features and working out who is who. Prints can be made of any event, but they are particularly popular for weddings. You will receive an individual A3 giclée print in an edition of three (one for your selves and a copy for parents) each signed by the artist and ready to frame. 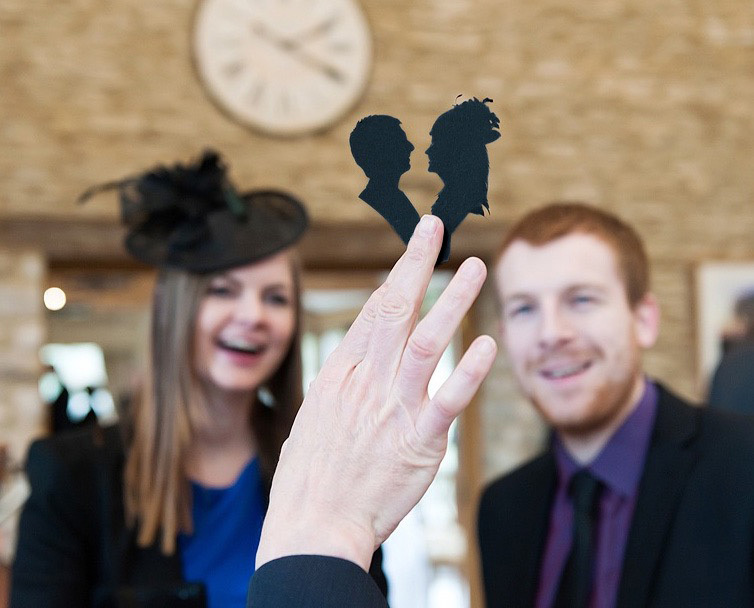 Last year we noticed a number of couples adding their silhouettes to the wedding cakes. What a great idea to have your profiles on the cake, rather than a generic Mr-and-Mrs silhouette! This is easily arranged when you meet Charles to discuss the wedding, using a video-link service such as Skype or FaceTime.